37-year-old Subodh Yadav and his accomplice Vipin Kumar, 42, were arrested in the car heist case. The duo allegedly confessed to the crime, giving details of their operation, according to officer Romil Baaniya. New Delhi: An undercover operation led to the arrest of two men who stole luxury cars in the Delhi-NCR region and nearby areas. 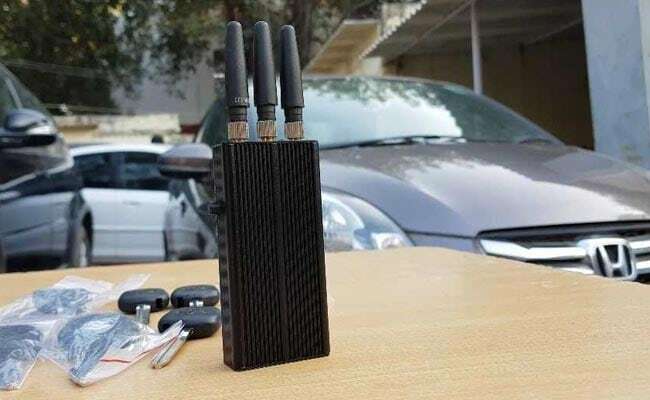 While making the arrest, the police recovered a mobile phone signal jammer along with other sophisticated tools that help read and replicate the ignition and lock systems of cars. The accused used the jammers to stop people from calling or texting the police from the crime scenes to divulge information. Yadav and Kumar allegedly bought damaged cars from insurance companies, and through a vast networke of engine and chassis numbers punchers, changed the numbers on the stolen cars to those of the damaged cars. They would then sell the cars to second hand car buyers. Kumar himself runs a car workshop in Chandigarh where he punches the engine and chassis numbers. The accused Subodh Kumar Yadav has more than 20 cases previously on his name, including murder and attempt to murder. Following many motorvehicle thefts, the Anti-Auto Theft Squad was alerted to the problem and they started probing into the cases. After building intelligence on potential auto-lifters behind the crimes, they were tipped to Subodh Yadav and Vipin Kumar's presence in Vasant Gaon. The informant allegedly told the police that the duo would be coming to Vasant Gaon to finalise another deal for a stolen luxury car. Acting on the information, the team laid a trap near the Valmiki Mandir there. Subodh Yadav and Vipin Kumar arrived in a car, before getting out. Sensing something was wrong, the two tried to make a run for it, but the team was alert and they nabbed both of them. They found that the car they came in, a Mahindra Rexton, was also stolen. Apart from the mobile jammer, the police recovered six stolen vehicles, including a Honda City and a Honda Amaze, and 20 keys of different cars among other instruments they used to successfully steal the cars.